Feathers inspire many meanings, lifting our dreams, thoughts and hopes on the wind, or allowing us a closer connection to the world around us. 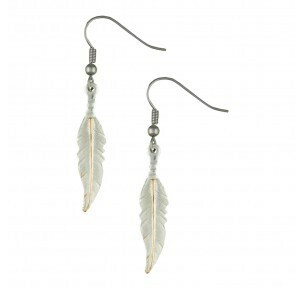 These small sharp feather earrings are finely engraved and tied at the shaft to dangle from French hooks ﾡﾦ. The perfect size for casual or formal wear. Sterling silver plate over a solid brass base. Hypoallergenic stainless steel French hooks.